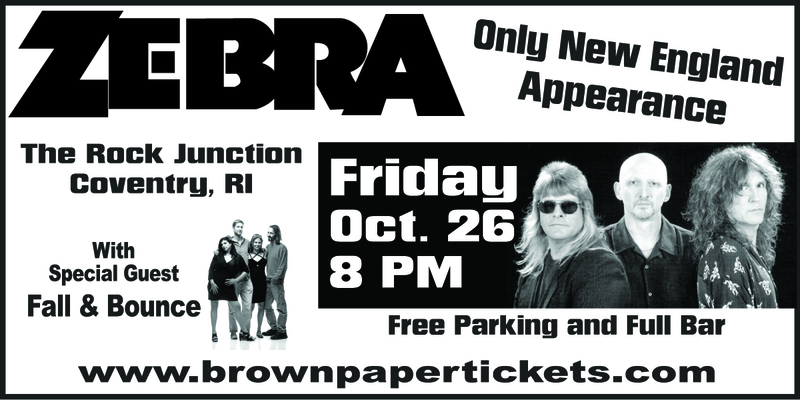 Zebra bringing over 37 years of entertainment to R.I.
Hard rock trio, ZEBRA, will be playing at the Rock Junction in Coventry, R.I., on Oct. 26th at 8 p.m. for a special show by Limelight Magazine publisher JKB Booking. Joined by local rockers Fall and Bounce, who will be opening the evening, ZEBRA will perform hits from their own catalog, plus a one-hour Led Zeppelin encore set. It will be their only New England appearance. “We used to do a lot of Led Zeppelin back when we first started in 1975 to 1979, so we have a pretty big repertoire to choose from,” Jackson said. Since they’re performing music they’ve been playing for more than 35 years, they don’t rehearse often. That comes in handy, said Jackson, as the members of the band don’t live in the same state. But that might change in the near future. In between gigs, the band is in the process of arranging new material, which they’d like to record soon. Also, on Oct. 18th they will be inducted to the Long Island Music Hall of Fame. While they originated in New Orleans, Louisiana, and were inducted to the Louisiana Music Hall of Fame in 2010, Long Island is honoring them, too. Despite a brief hiatus in the early 1990s, the band has been together for 37 years. The “roughest” part, Jackson said, was the first five years. Jackson mentioned that the members shared many of the same interests in music when they first formed and were heavily influenced by Led Zeppelin, Rush, The Moody Blues and YES. The Beatles are also high on the list. In addition to playing with ZEBRA, Jackson often performs solo acoustic gigs, as well as shows with symphony orchestras throughout the United States, doing arrangements of music by Led Zeppelin, The Doors, Pink Floyd and The Eagles, to name a few. He began teaming up with the orchestras in 1996, when his now-late agent Jim McGinnis contacted and informed him that an East Coast promoter started a company that combined classic rock with an orchestra. The concept was to perform the music of one group at each show. As noted, Jackson is a fan of The Beatles, and in the liner notes of the ZEBRA’s best of CD, he mentions that the first concert he ever saw was The Beatles at City Park Stadium in New Orleans in 1964. He was just nine-years-old at the time. Jackson said that his neighborhood friend wanted to go to the show, too, but his parents didn’t take him to the show because they didn’t approve of The Beatles. Little did they know the band would be one of the most successful and influential acts of all time. For tickets to the Oct. 26th show at The Rock Junction, visit www.brownpapertickets.com/event/239202. Tickets are $25 in advance and $27 the day of the event. For more information about ZEBRA, visit their website thedoor.com.